We infer sectoral productivity from trade and production data and test the hypothesis that technological catch-up is slower in tacit knowledge intensive sectors, operationalised by measures of complex task intensity. Furthermore, we examine whether catch-up is slower in sectors with a large skill intensity, a high degree of export sophistication and high income elasticity. Employing Comtrade and UNIDO data between 1960 and 2000 covering manufacturing sectors, we find that catch-up is slower in more tacit knowledge intensive sectors, as well as in skill intensive and export sophisticated sectors. 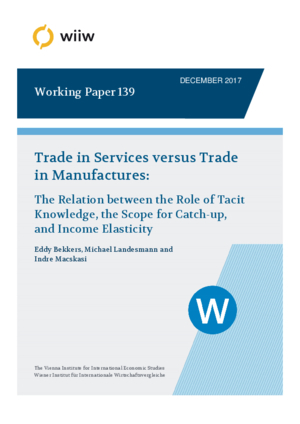 With more recent data from 1997 to 2011 from GTAP we find instead that catch-up is faster in more tacit knowledge intensive manufacturing sectors, whereas catch-up is slower in more tacit knowledge intensive services sectors. Catch-up is consistently faster in income elastic sectors, both for manufacturing and services.